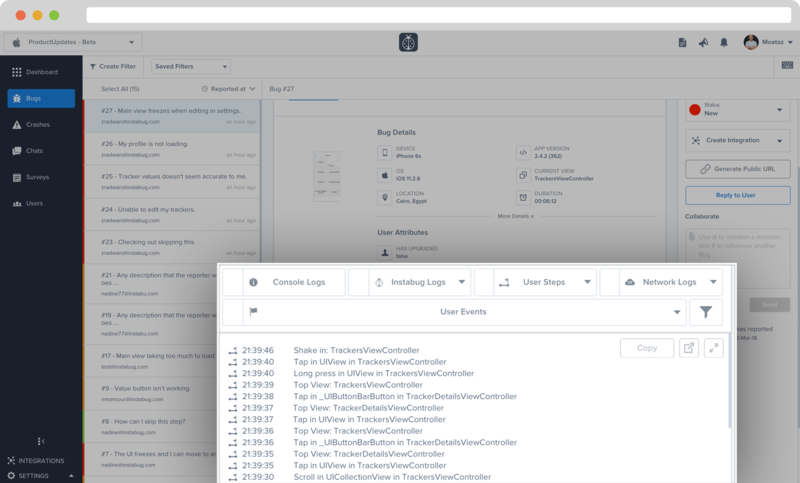 To easily reproduce the bug reports your users have encountered and reported, Instabug automatically tracks the steps users have taken in the app before a bug is reported or a crash has occurred. We are enhancing our User Steps making them more structured, readable; alongside with capturing more gestures so you easily collect the needed insights to solve your bugs faster. We are capturing your UI components from text to labels and bringing them associated with the bug reports for better understanding. For iOS, we are now capturing the tap, long press, force touch, swipe, scroll and the pinch gestures. For Android, we are now capturing the tap, double tap, long press, swipe, scroll and the pinch gestures. Check out the structure of the user steps you will receive on your dashboard for iOS & Android. Learn how Instabug can help you iterate faster, build better apps, and drive five-star reviews through bug reporting and crash reporting.